Are you searching for the best RV water filter? If your answer is yes then you’re visiting the exact right place as you’ll be on your way towards getting a clearer idea about 10 of the most reliable water filters for your recreational vehicle. 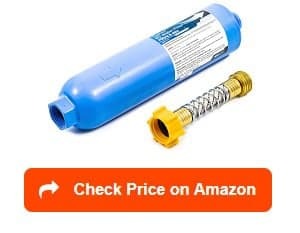 A short buying guide and FAQ section will also follow, making it much easier for you to figure out which water filter for RV hose can provide you with several benefits. One water filter that I will always recommend for anyone who is in search of a high-quality water filter designed for RV use is the Camco 40043 TastePURE. What I initially like about this filter is its large capacity. In fact, it has a larger capacity, allowing it to last the whole season. It’s actually a 20-micron, high-flow sediment, and carbon filter, which works in significantly reducing the growth of bacteria in the water it treats. It is designed with a wide body, which supports its high flow rate and capacity. The built-in granulated activated carbon is also beneficial at it can offer you safe drinking water regardless of the source of potable water. It works in reducing bad odor, taste, sediment, and chlorine in drinking water. In addition, it’s also great for use in any campsite. 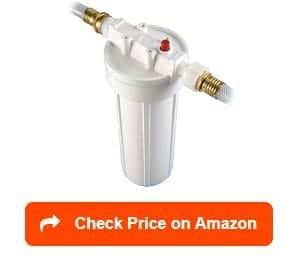 What’s even better about this Camco water filter is that it is capable of preventing mold, bacteria, and fungus from growing in the filter in case you don’t use it. I also like the water filter’s in-line design as I find it really effective in streamlining the flow of water. It’s equipped with a flexible hose protector, too, which works in minimizing the risk of kinking. 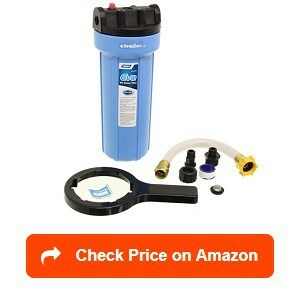 I would also like to suggest checking out this Camco EVO premium water filter. 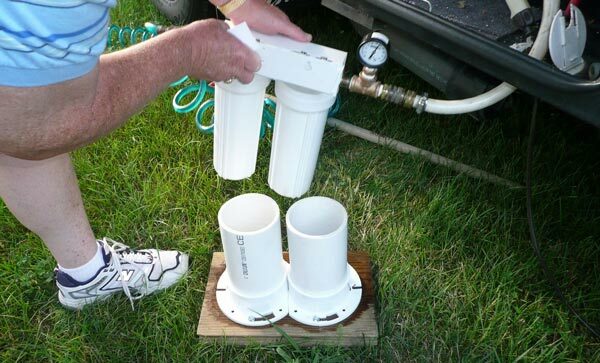 I find it really impressive as it works as an effective self-contained filtration system, which you can easily attach to the supply line of your RV, resulting in the delivery of fresh-tasting and clean water regardless of the water source in a campground. I noticed that it works by combining physical filtration with an activated charcoal as a means of getting rid of microorganisms, particulates, bacteria, and chemicals, such as chlorine. With that, there’s an assurance that you will constantly have access to safe and healthy water, which tastes fresh and great. Another reason why it continues to leave a good impression is that it is designed for RVs and campers. You can readily use it as the product already comes with a 12-inch extension hose. You can also make use of its one polypropylene filter cartridge. Furthermore, I am sure that you will also love the extra filtration as well as bacteria control that it offers considering the fact that it also boasts of a granular-activated carbon bed. It’s quick and easy to install while also promoting a streamlined water flow with its in-line design. If you are planning to compare Camco 40013 vs. 40043 then I’m pretty sure that you’ll find this section helpful as it talks about the Camco 40013 water filter. I like the fact that this water filter has a wide range of uses considering the fact that it can offer protection against many things. It can protect your water from aluminum, cadmium, bacteria, bad taste, fungus, iron, hydrogen sulfide, chlorine, heavy metal, lead, odor, sediment, and iron, among many others. With that extensive protection, you are assured of the ability of the water filter to make your drinking water not only safe but refreshing, too. I also think that you’ll be impressed with the durability and premium design of the filter. It features a 100-micron fiber barrier, which works in improving the filtration process. In addition, it has a wide body, which guarantees that it also has a large capacity, giving it the chance to last the entire season. What’s more? It is equipped with a highly flexible hose as well as an in-line design, which you can use for kink-free and high water flow. I also highly recommend checking out a Culligan RV water filter. In this case, I’d like to introduce the Culligan RV-800 RV water filter. 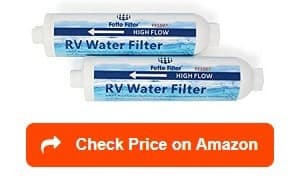 I am impressed with this water filter as I noticed how easy it is to connect it not only to RVs but also to boats, motorhomes, campers, and trailers. Such ease in connection is made possible with its 12-inch flexible hose. It also takes pride in its slim design, making it really ideal for use in recreational vehicles. I’m assured of its ability to minimize the odor and taste of chlorine as well as bacteria and sediments in water because of its quick fill design and high flow rate. It also has a long cartridge life that can last for a max of 2,000 gallons. One more thing that’s impressive in this Culligan water filter for recreational vehicles is that it is compatible with all standard hose fittings. Another noticeable feature in the product is the bacteriostatic filter media, which is effective in limiting the growth of bacteria. I also noticed that it’s designed in such a way that anyone can install it easily and quickly. The hose is prone to kink. I think another water filter from Culligan that is worthwhile for you to check out is the Culligan 1019084. I like it specifically because it boasts of its solid and sturdy design, which makes it suitable for exterior water filtration in a recreational vehicle. This high-quality filter is constructed in such a way that it provides better-tasting water. It also guarantees a cleaner water storage tank. I find it perfect for use in recreational vehicles because it comes with a convenient hose fitting kit as well as a slim design. With that, I know that you will find it easy to install and store. It comes with a filter cartridge, too, which is efficient in removing sediments, bad taste and odor, as well as chlorine taste, and odor in water. 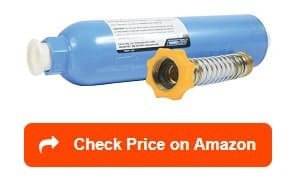 I also noticed that it comes complete with most of the things that you need to make the water filter work, including the hose connection kit, filter housing, filter change reminder sticker, and replacement cartridge. It even comes with instructions on how to install and operate it, offering more convenience on the part of the user. You can also go for a Watts RV water filter in the form of the brand’s POE12DSA1KDF dual-exterior model. I noticed that this water filter from Watts Water Technologies performs a really efficient and remarkable job in filtering water in your RV. I am sure that it will constantly provide you with safe and clean drinking water because of its ability to reduce a lot of contaminants found in the water. Installing the water filter in your RV, therefore, can give you peace of mind. One noteworthy fact about this water filter is that it utilizes a sediment filter. Such filter is also equipped with a multi-ply filter media, which, I think, is really beneficial because it provides a great holding capacity. In addition, it lengthens the life of the filter. It also comes with a GAC/KDF filter, which does a good job in getting rid of inorganic contaminants prior to reaching the carbon bed. This results in a high level of protection from bacteria buildup and fouling. It also comes complete with a cartridge, hose fittings, bracket, and wrench. I can also say that the Camco 52700 Hydro Inline Water Filter is one of the most reliable products in the water filtration industry. One specific feature I like about it is the catalytic carbon filtration that it uses, which is helpful in constantly produces clean and safe water from any source of potable water. The catalytic carbon is also used together with KDF 85 as a means of reducing heavy metals and chloramines found in potable water. With the help of the KDF 85, heavy metals will be trapped, which is a major help in preventing the growth of bacteria, especially if you are no longer using the filter. I can also offer an assurance that this can extend the lifespan of the filter. The durability of this in-line water filter is also unquestionable. It boasts of its wide body, which is helpful in providing high water flow. It also boasts of its large 8,000-gallon capacity. I am also impressed with the inclusion of a flexible hose protector into this unit. It is because I find the hose effective in minimizing the strain taken by the spigot or faucet from the water filter’s weight. Another RV water filter that you can use is the Hydro Life 52141 HL-200. One thing I noticed right away is that it’s primarily designed for RVs, boats, and trailers provided they come with an external water hook-up. Expect it to work in filtering water prior to entering the freshwater tank. One positive quality of this product is that it is adaptable, which allows it to be installed permanently. I also like the fact that it works as a high-volume water filter as it instantly means that it is capable of getting rid of almost all lead and chlorine present in water. It also constantly leaves a positive impression because it makes use of a patented KDF media along with GAC (granulated activated carbon), which promotes a high level of protection and filtering when dealing with contaminants. Safe, clean, and good-tasting water can also be expected as it’s free of foul odor and bad taste. I am also sure that you’ll be impressed with the garden hose connector included in the kit as you can use it in replacing cartridge effortlessly even without tools. It’s also compatible with a garden house connection. Another RV and marine water filtration system that you can check out is this one offered by Fette Filter. What’s so remarkable about it is that it features two RV and marine inline filters as well as one flexible hose protector. I also like the wide body integrated into this filter as it results in a high flow rate and capacity. With such high flow and capacity, I am a hundred percent sure that it is capable of lasting for the whole camping season. One more thing present in it is an activated carbon, which promotes the constant supply of safe drinking water. It’s also possible for the activated carbon to give you a high-quality water, which can improve your nails, hair, and skin condition. I find the sediment filter that it uses perfect for campsites, too, as it significantly lessens chlorine, sediments, foul odor, and bad taste in your drinking water. The filter also boasts of a decent lifespan as it can last for around three months. Note that its life will also be dependent on the quality of water. 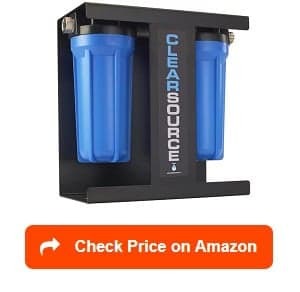 Lastly, I want to recommend the premium RV water filter offered by CLEARSOURCE. What I love about this water filter is that it has a premium design. In fact, it is designed sturdily to deal with the rugged lifestyle of any RV owner. It boasts of its rugged and sturdy metal chassis with a powder coating. 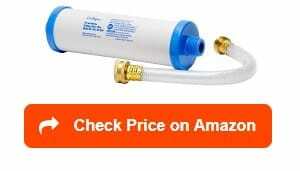 It is beneficial as it promotes ease of setup or installation between your RV’s freshwater connection and the water source. I am also impressed with its 5-micron sediment filter, which performs really well when it comes to getting rid of sediments. There is also a 0.5-micron 2nd stage carbon filter, which is effective in removing a lot of contaminants and chemicals from water, including cysts, volatile and organic compounds, giardia, and chlorine. Another thing that I really like about this premium water filter is that it is made to stand up years of abuse with its really sturdy and solid construction. I am impressed with its highly durable fittings and hardware constructed out of stainless steel, too. It is also very convenient to use with its built-in stand. Type – One factor you have to consider when searching for the ideal RV water filter for your needs is its different types. One of your options is actually the in-line filter, which you can use at your RV’s entry point. It’s a good choice if you’re planning to do basic sediment filtration and get rid of bad odor and taste in water. You may also choose the compact canister. Similar to the one, which is mainly used for a whole house system, this filter still has its own distinction in the sense that it is more compact. This results in the filter fitting in your RV. You can also customize it based on your specific needs. Another type that you can choose is the reverse osmosis. It’s a good choice if you want to purify water. Other options that you have are the sediment and carbon filters. How much water you plan to filter – It’s also advisable to make a decision based on the amount of water you plan to filter. In this case, ask yourself first whether you want to filter all water or just some of your sources of water. That way, you can decide on the specific type of filter that works for you. In case you are exposed to dirty water with sediment, then you may want to invest in an RV water filter capable of filtering all water in your RV. In this case, you can go for sediment filters that are known to be common in RVs. Ease of use/installation – Make it a point to choose a filter, which is never that hard to use or install. Remember that you will be replacing it after some time – after around 3-12 months. Make sure that you won’t deal with a lot of hassle once it’s time to change the filter. What is an RV water filter? An RV water filter is a product, which works in getting rid of impurities from water. It does so by reducing water contamination with the help of a fine physical barrier or a biological or a chemical process. The major function of an RV water filter is to cleanse water to various extents, so you will have a constant supply of clean water. Note that a water filter does not have to be a purifier in order for it to perform its main function. Anything, which is capable of getting rid of any amount of bacteria, sediment, and particles, is already helpful. The best one is also capable of removing the taste of chlorine in your water. In most cases, the filtration system used in this product comes with an activated carbon charcoal filter, which is often designed inside a pitcher or included as a major component of a tap-installed or faucet-mount filter. To perform its functions, it uses certain methods, like sieving, ion exchanges, and adsorption, among many others. These methods and processes are effective in getting rid of unwanted substances from water. A water filter can get rid of particles that are much smaller compared to the holes where the water passes. A water filter installed in your recreational vehicle can help ensure that you drink great-tasting and clean water. It is a must-have during your hiking or camping trips as it ensures that you will have a constant supply of safe drinking water when necessary. In most cases, it works in removing dirt using two different methods or techniques. The first one is physical filtration, which involves straining water as a means of removing large impurities. This means that a physical filter works as a glorified sieve. It could be a fine textile membrane or thin gauze, which sieves the water and removes particles and other impurities along the process. The next method of filtering is known as chemical filtration, which works by letting water pass through an active material designed to get rid of impurities in a chemical manner. 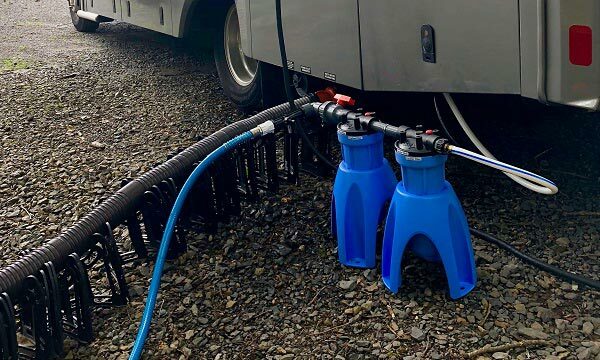 If you want to filter all water, which goes into the holding tank of your RV, then it would be best to pick a water filter, which is connected to a hose. In this case, you need inline units that combine the processes of sediment removal and carbon filtration. These units are known for their decent taste and odor removal capacity. However, they have limited capacity in terms of removing sediments. These units are small in size, which makes them sufficient filters for those who do not make use of their vehicle frequently. If you need a better flow and longer shelf life, you need a canister system at a standard size. You can customize and configure this system for special purposes. If you often plan an RV trip and you wish to ensure that you will never run out of a clean and odor-free water, then you need to invest in the most reliable water filter. This unit can lessen the chance of odors, chlorine, bad taste, and other items from penetrating into your water. Sediment filter – This type of water filter serves as a mechanical strainer, which works in catching particles within the water. Note that sediments have the tendency of fouling up the water system components of your recreational vehicle. It can result in maintenance issues. The sediment filter is effective in protecting not only your water pump but also your toilet valves, faucets, and water heater. It is preferable for all RV owners to install at least a sediment water filter into their vehicles. 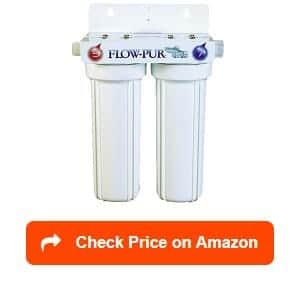 Carbon filter – What is good about this specific water filter is that it is capable of improving the odor and taste of water. This is a function that you can’t expect the sediment filter to perform. The majority of carbon water filters today have the ability to lessen bad taste and chlorine in your water. Some of them can also remove contaminants, like mercury, volatile organic compounds, asbestos, and lead. It is divided into three types. The first one is the granulated activated carbon filter, which is the most inexpensive and common type of carbon water filter. It works by letting water pass through tiny grains of activated carbon, like charcoal. While this one is beneficial, it is not as functional as the other two types because it has a minimal surface area for the activated carbon. Another type of carbon water filter is the solid block carbon. It utilizes pulverized activated carbon, which is shaped into blocks using high pressure. Compared to the granulated type, the solid block provides more surface area for the activated carbon. This type prevents the formation of channels and ensures that water comes in contact with the carbon. The third type is the modified carbon block. While it performs similar functions as the solid block, take note that the modified carbon block showcases a better water flow rate. It can also last longer. Ceramic Filter – You can also choose to invest in a ceramic water filter. It has small holes that allow it to screen out various elements in water, including bacteria, giardia cysts, sediments, and protozoa. While it is not that effective in removing chemical contaminants, some of these types feature a carbon part, which can get rid of chemicals. 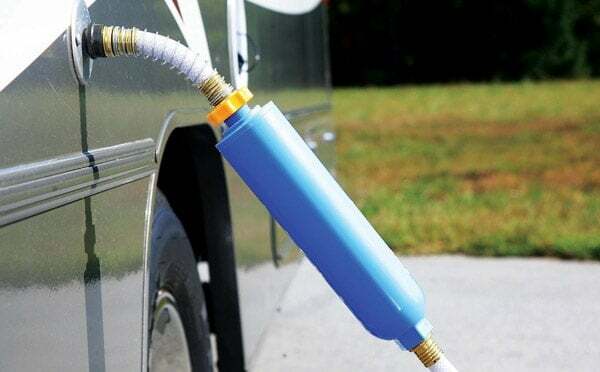 The ceramic water filter is also ideal for your recreational vehicle if you are concerned about biological pests penetrating into the water supply in your RV. Reverse Osmosis – This makes use of a space-age technology designed to filter water, which can produce almost pure water. The key to the proper functioning of this unit is its semi-permeable membrane, which works in blocking all particles that are bigger than water molecules. One benefit of reverse osmosis is that it can remove arsenic, fluoride, perchlorate, hexavalent chromium, and nitrates in your water. However, it is incapable of removing chlorine, which is the main reason why the majority of reverse osmosis systems today also feature a carbon filter. Offers convenience and peace of mind – Having fresh and filtered drinking water all the time offers utmost convenience to the majority of RV owners. Note that you need clean drinking water while you are on the road. With the water filter around, you have a guarantee that you get to access it all the time. This will allow you to relax and have fun in your adventure at all stops. It is also easy to use as you just need to set it to start functioning. Once set, you can just forget it as it takes about a year for you to have the need to change its cartridge. Removes sediments and contaminants from water – This function ensures that your constant supply of water is indeed clean. You do not have to worry about drinking water, which is bad for you and your loved one’s health. Aside from removing sediments and contaminants, most RV water filters can also enhance the taste of water inside your vehicle. Compact and lightweight – Traveling on the road often might cause you to deal with issues related to weight and storage of water. It is inconvenient to bring large water bottles during your trips as aside from being heavy, they are also difficult to store. To solve this issue, you need high-quality water filters. They are compact and small, so you do not have to worry about storing heavy and bulky water containers. Due to their compact and small nature, you can also conveniently bring some spare replacement cartridges on your travels. In general, the actual benefit of having a water filter in your RV is that it offers a guarantee that you will have a constant supply of safe and high-quality water regardless of where you decide to travel. What are good RV water filter brands? Considering how important and beneficial water filters are especially for those who are constantly on the road, it is no longer surprising to see various brands competing for the attention of potential buyers. With that in mind, you will never have a difficult time finding good brands of this product. One famous brand of RV water filters is Camco. This brand continues to wow the public with its high-quality and durable water filters. Another popular brand is Culligan. The water filters of this brand are popular because of their user-friendliness and versatility. In fact, you can use their filters for various applications, like in your RV, camper, trailer, motorhome, or boat. Other famous water filter brands for RVs are Clearsource, Hydro Life, and Watts. Camco 40043 vs. Camco 40045: which one is better? Camco 40043 and Camco 40045 are actually two of the most functional and famous water filters from the renowned brand, Camco. The two actually have a lot of similarities – one of which is the fact that they come in 2 packs. Both also come with an inline design and boasts of a high flow rate. In addition, Camco 40043 and Camco 40045 are known for their ability to reduce bad odor and taste as well as sediments and chlorine in drinking water significantly. The versatility of these two filters is also undeniable. In fact, it is versatile enough that it has several uses. For one, you can easily connect them to a standard water or gardening hose then expect them to provide you with cleaner and healthier water. It is also compatible with a number of uses, including RV, boat, and camper use, as well as for washing cars and pets and gardening. However, they also have differences. One notable difference between the two is the fact that the Camco 40043 comes with its own flexible hose protector. The flexible hose protector for Camco 40045, on the other hand, needs to be purchased separately. This means that Camco 40043 is a better choice if you do not want to spend more buying a hose protector. Camco 40013 vs. Camco 40043: which one is better? Two products from Camco that have also been constantly compared are the Camco 40013 and Camco 40043. Both of these units work effectively in reducing bad taste, sediment, chlorine, and odor significantly from your drinking water. The two can also be expected to last for one whole camping season. To determine which one between the two is the better choice for you, you have to check what type of activated carbon you prefer. Note that the Camco 40013 uses high-flow carbon with KDF. Camco 40043, on the other hand, uses granular activated carbon when it comes to supplying users with safe and clean drinking water from all sources of potable water. Can I filter all the water used in RV or only the drinking water supply? What is good about most water filters today is that you can use it to filter all the water in your recreational vehicle, not just the drinking water. This is a good thing considering the fact that you need to filter all the water that goes to your RV. You need to make sure that the water you drink, wash with, and cook with is safe and clean. Note that traveling and using water from various sources regularly can cause problems regarding the quality of water you are drinking or using. Your drinking water might contain microbes, pesticides, and contaminants, so you need to filter it. If you wish to filter not only the water you drink but also the water you use for cooking then a wise choice is to install an in-line filter beneath the sink, especially those where you drink water from. Installing this type of filter is straightforward. The majority of water filters that can be installed beneath the counter also supplies a bypass line, which can be installed once you winterize the vehicle. Can I use reverse osmosis for RV? When? The answer is yes. Note that reverse osmosis is a simple process, which involves purifying water. It is suitable for use in recreational vehicles. Reverse osmosis works by reversing the natural osmosis process. This is a vital process used by most living organisms. Reverse osmosis also works in producing highly purified water, which has low salt and mineral content. It works effectively as a water softener, purifier, and filter combined in just one system. Due to this, it is no longer surprising to see numerous RV owners processing all their water using reverse osmosis. How can you replace an RV water filter? To replace an RV water filter, the first thing that you have to do is to use a canister wrench to unscrew the canister. The next step involves turning the wrench to the left while facing the front part of the RV water filter. Your goal is to loosen it a bit. After that, you will most likely be able to unscrew it by hand. Take out the filter element then discard it. The next thing that you should do is to rinse the canister. Once done, installing the new filter element should come next. Keep in mind that the two canisters are capable of taking various filter elements. The right hand canister is capable of taking the .5-micron carbon block while the left one is capable of taking the 5-micron sediment filter. Your goal should be to ensure that the new filter elements are installed in the right canisters. The next step involves screwing the canister into the mounting head. Use the canister wrench to tighten it. To do that, turn it to the right and apply a moderate yet firm pressure. During the time you change the water filters, you have to assess the O-ring found within the canister. Check if there are cracks. If there are, then it may be time to replace it. In case it is just dry, just use a silicone lubricant to lubricate it. The time you decided to change or replace your filter should also be the perfect time to examine the hose washer found on the system’s inlet side. You might need to replace it in case it is either cracked or dry. How do you clean an RV water filter? Learning how to clean your RV water filter is crucial in ensuring that you will not have to replace it too often. Note that replacing or changing the unit every few months is not only expensive but also harmful to the environment. The good news is that cleaning it up does not require you to follow very complex steps. The first step involves backflushing the water filter. To begin this process, just reverse the filter’s flow so it can flush away any accumulated gunk. Doing this is often dependent on the kind of water filter you own. In most cases, however, it requires you to utilize a hose or syringe, which often comes along with your filter. All you have to do is to use either of them in reversing the flow. You can use it to press the water backward. If you use the water filter frequently then reversing the flow is probably the only thing you need to do to clean it up. In case it is already dry for a while then allow water to go through it in the typical direction prior to reversing it to add moisture to it. The next thing that you can do involves brushing the water filter. Note that you can brush some water filters as a means of removing its accumulated gunk without having to reverse the flow. Before doing this, though, ensure that your filter is suitable for brushing. You can determine that by checking the product’s manual. If it is safe to brush the filter then use a brush with soft bristles as a means of removing the gunk buildup gently as well as any other buildup on your water filter. You can also utilize chlorinated tap water. Note that this works in clearing out the bacteria found in the filter. The only thing you need to do is to let at least a gallon of water run through your water filter normally. With that, you are guaranteed to clear the unit from bacteria. In case you do not have a chlorinated tap water, what you can do is to pour around eight drops of unscented and clear liquid bleach to one gallon of water. Stir this mixture then allow it to sit for thirty minutes prior to utilizing it. If you wish to disinfect your filter then it is also possible for you to do it by strengthening your bleach solution a bit. You can do that by mixing around a cup of bleach in one liter of water. Once you are done with cleaning, make sure to dry the unit thoroughly so it will be ready for storage. One thing that you can do in this case is to allow it to air dry by putting it in a well-ventilated and warm area. Avoid putting it in direct sunlight. How long does an RV water filter last? How often should I change it? RV water filters last for around 3-12 months depending on the brand and the quality of the product. That said, it’s advisable to replace it every 3 to 6 months. As mentioned, there are also certain models that can last for up to 12 months. Such products should be changed at around 9-12 months. Make it a point to observe the output after the filtering process, too as this will also give you an indication whether it’s already time to change it. In most cases, changing or replacing the RV water filter is already necessary if the water flow tends to slow down or if the color of the water gets darker. Can I use it for hot water? The answer is no. It is because hot water can’t be filtered adequately when you run it in the RV water filter. In fact, it might reverse the process of absorbing chemicals, causing the release of contaminants back to the water. That said, only use the filter on cool or cold water. In case of accidentally running hot water through your chosen filter, you can fix that by running cold water to it for around two minutes. That would be enough time to flush the hot water out. Yes, the RV water filter might also leak, especially if you have already been using it for quite a while. If you notice leaks, then it would be best to remove the water filter first. Check it thoroughly for damages or cracks. If there are indeed damages or cracks then you may need to change or replace it with a new one. Another possible reason for the leak is the incorrect installation of O-rings. Examine the O-rings and ensure that they are still in the right places. In case of missing or damaged O-rings, a replacement of the filter may also be necessary. 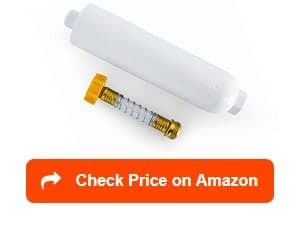 How to install an RV inline water filter? To install your chosen RV water filter, you have to install the rubber hose seals on the canister’s two sides first as well as the shut-off valve of the garden hose. Use plumber’s tape to wrap all fittings. You should then let the canisters line up using the correct flow pattern. After that, install the PVC pipe fittings as well as the hose adapters on the two sides of the canister. The next thing that you have to install is the canister O-ring. You should also set the white filter cartridge next into your canister. Tighten it to its head. Do the same for the carbon filter then shut off your RV’s water supply. The next step is connecting the water line from the source of water to the canister’s head. Connect a 3-feet water hose approved for RV hose to the head then next to the inlet. Turn on the water supply in your RV. This is the time when you should check for leaks so you can tighten the fittings again if necessary. After that, decide on where you plan to mount the filter. Once you have made the decision, you can mount it using the provided brackets. An RV filter is usually made of a kind of filter media, which works in mechanically trapping pollutants. In most cases, this filter media comes in the form of an ultrafine sieve or web, which acts similarly to a tea strainer when it comes to trapping unwanted particles in the water. Other water filters are constructed based on the process known as absorption. It works by retaining the contaminants in a medium or adhesion’s microscopic pores where they are attracted just like a magnet to the media’s molecules. Finding the best RV water filter is a must, especially if you plan to travel on the road frequently. With the aid of this filter, you have an assurance that you will always have an access to safe and clean water. We would like to thank you for reading this article. Find out more about how to choose the best RV water pumps, best RV water softeners, best RV tankless water heaters and best RV water pressure regulators with our reviews and ratings. Furthermore, please take a look at the best RV water hoses and best RV shower heads, to choose the best one for your RV freshwater systems. I have used the blue Camco 100 micron filter. It no way compares to the green Clear2o 1 micron RV filter for removing odors and taste for drinking water. I believe you should rerun yours tests. You just help me to get my new water filter for my old RV. Thank you! The Clear2O RV Inline Water Filter surpasses performance on all the filters mention on this article. It filters water at the one micron level. It uses a solid carbon block instead of granular carbon. Big difference. The ones mentioned above filter at the 100 micron. This is a big difference. Thank you for your reviews. Please add GPM when reviewing them next time. Some filters may work well (or not), but you need to compare micron filtration and GPM to figure out if that filter will work for you. I used to love the Hydro Life filters. Now they are not worth their price. Most of our travels are areas where the water is very “hard”. I am as much concerned about filtering the water to maximize the life of our water heater and plumbing fixtures. Which filter does the best job in doing that? Wow, this is the most detailed review of RV water filters that I’ve come across. Thanks so much for sharing this. Hi Stephen, good article… thank you. My husband and I are full-time RVers, with a family-owned business, RV Water Filter Store since 1992, where you can learn, buy and get support all in one place. 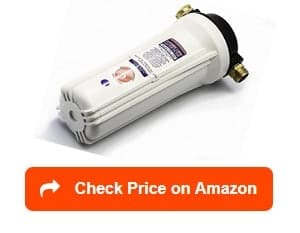 We sell everything ‘RV Water Filter and Plumbing’ related and are proud of our 5-star ratings on our online store as well as Amazon. One thing we offer that puts us ahead is we are a trusted source, one phone call away from expert help 5-6 days a week. I just wanted to offer our services and products to you and your readers should you need them. Thank you so much!